Receive, Batch import and store resumes into different folders which can be customized freely. 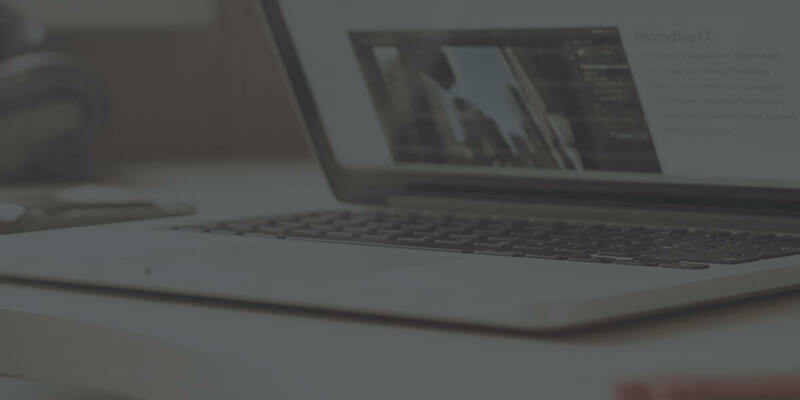 Each resume uploaded will be full-text parsed and indexed. Organize resumes into talent tool pools and folders. Provide full-text search engine and flexible filter capabilities. Organize and schedule interviews for your applicants and candidates, evaluate their skills and monitor the recruitment process. Integrated resume database system and recruiting software. How do we improve your hiring efficiency? 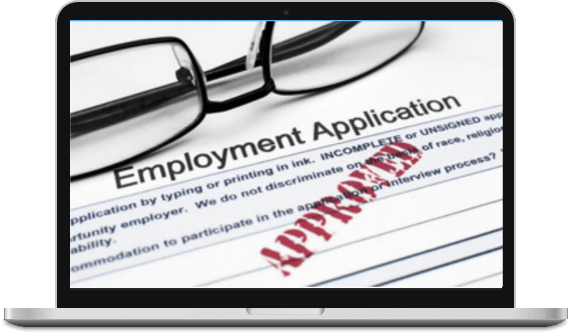 Our system accepts, reviews and manages high volume of resumes and applicants from various job boards, parsing attachments and building full text indexes. 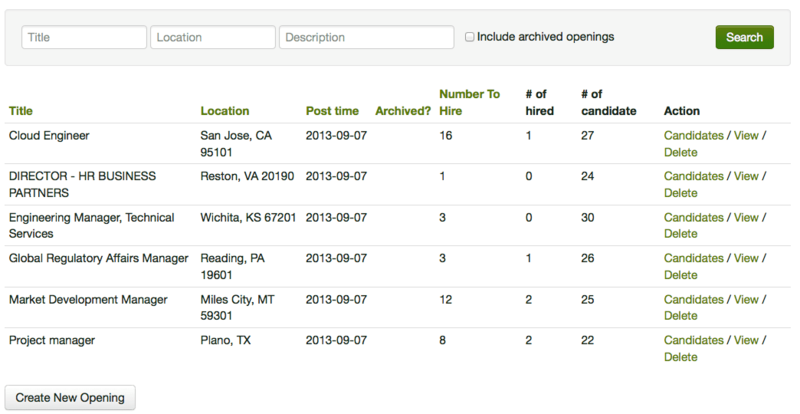 We keep tracking all the resumes, applicants and candidates. 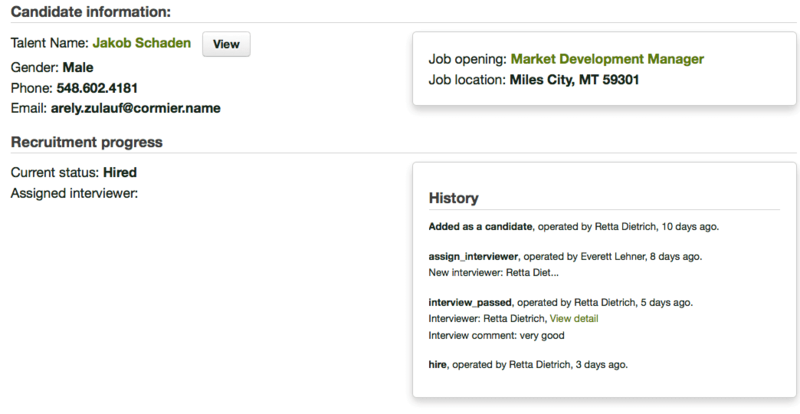 Recruiters could use the platform to share comments and feedback on candidates. Provide an integrated information center for all the resumes, skills, applicants, candidates and interviews. 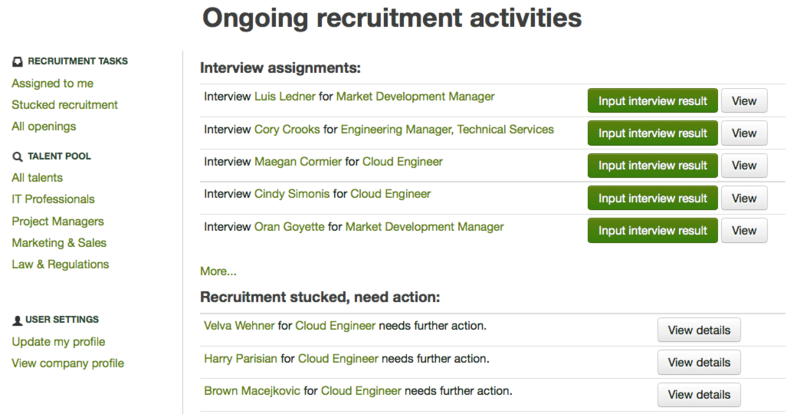 A collaborative recruitment platform across your organization, with flexible recruiting process to organize interviews. 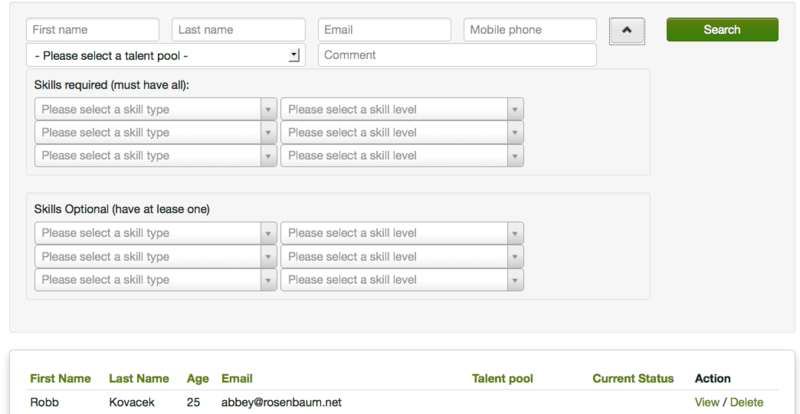 Organize resumes into talent pools and folders, with full-text search and filter capabilities. Interface multiple job boards, and consolidate all the job application into our system, visualize all the recruiting data. Wanna give it a try? No problems. And, We won't send you promotion email or newsletters. How the system manage your applicants and candidates? Want to improve the lengthy recruitment process, try our system and find those 'pending' candidates immediately, take actions to schedule interviews or make hire-not-hire decisions. Here's where you will find more info on improving recruitment process. 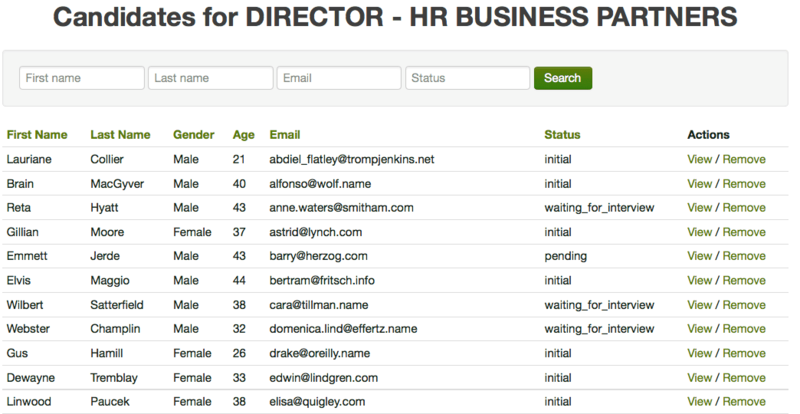 Also in our system , you can review the progresses of all candidates and get them interviewed as soon as possible. 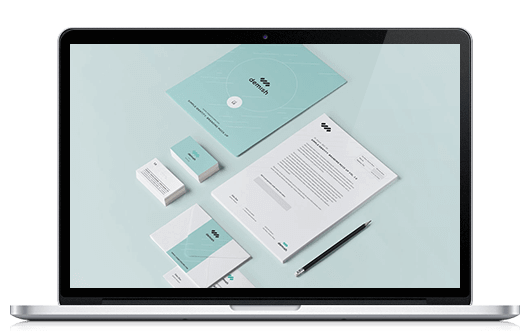 We provide an integrated dashboard for each user, who can view all his(her) interview assignments and get to know whether he needs to take actions. Summary view for all job openings, what are their current recruiting progresses, the number of planned to hire, current candidates, and already hired. Review all the information for a candidate including all the interview histories, current state. Ensure the recruitment task owner to take action to advance the recruitment. Create different talent pools for different job categories, evaluate and record the level and experiences of each skill for each applicant, quickly find candidates needed with our powerful talent search engine(skills required and skills plus). And full text search is also available, you can directly search all information, including resumes and attachments, to find appropriate candidate and talent in your talent pools. 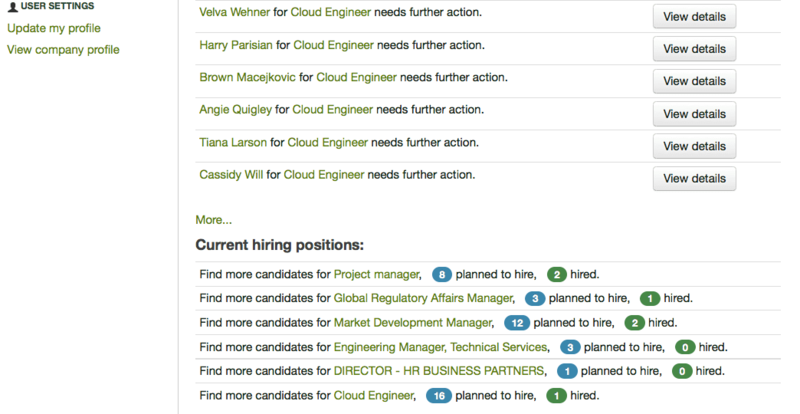 Provide an integrated view for current active job openings, how many planned to hire for each job position? how many candidates we currently have? How many already hired? Still not enough? click here for more screen shots, or just begin to try the system now.